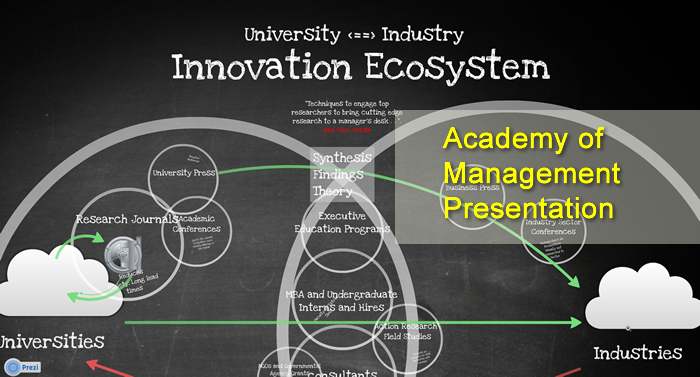 We enjoyed sharing the following slide presentation with the Professional Development Workshop at AOM 2013 in Orlando, Florida within an overall session called “Translating Scholarship into Practice: How Can Scholarly Research Be Translated Into Practice?” It also can be found at Prezi.com at this link. Shared content and services on the Internet is not new. Cloud computing expands shared services with a concept of shared infrastructure elements, which deliver shared content and platforms as an interconnected system. NIST framed cloud computing as: “on-demand self-service, broad network access, resource pooling, rapid elasticity or expansion, and measured service” (NIST, 2011). SaaS, Software as a Service, has been expanding over the past decade. SaaS provides to customers all layers of service from infrastructure to end delivery of a web-based product. That service also can be provided in layers of infrastructure and platforms, dropping the costs of launching new businesses upfront. Infrastructure as a Service (IaaS) and Platform as a Service (PaaS) then allow other companies to launch platforms and software with scalable storage and delivery. This model can shift IT growth from a step-function, up-front capital expense to a more fluid, scalable, operating expense (Armbrust et al., 2009). These systems are deployed across four models– public clouds, private clouds, community clouds, and hybrid clouds–all with different combinations of privacy, ownership, and sharing (NIST, 2011[i]). To the consumer, SaaS is the public face to their cloud-based media lives and habits. Consumer products—such as Netflix, Dropbox, Spotify, Tumblr, or other connected services—might be living on Amazon IaaS cloud-based servers and a connecting PaaS platform. Distance: Costs of communicating and sharing content over distances has plummeted over that same time (Cairncross, 1997)[iii]. These three drivers have set the stage for our more complex current media environment of 2012. Due to the breadth of content available, legally and illegally, consumers have built up large portfolios of existing digital content across a variety of devices and hard drives. They also have accumulated years of DVDs and CDs. The ease of saving and storing this content previously was limited to hard drive and shelf space. Shelf space has not grown in most homes, but the low cost of hard drives has let consumer build up large amounts of digital stuff. Meanwhile, consumers have owned enough hard drives over time to realize that they do not provide infinite storage life. Hard drive failure rates, estimated in mean time between failures in the millions of minutes, have shown in testing to be 2-4%/year, and even as high as 13% in a 2007 Carnegie Mellon study[iv]. In addition, digital stuff is now shared across home networks, computers, individuals, and devices. Mobility. The challenge has expanded with the growth in mobility, as tablets and smartphones draw content and leisure time to places other than living rooms and computer screens. Time. The biggest challenge, which we will engage below as well, is the perception that consumers now don’t have time. The time to deal with faded hard drives or figuring out how to move content from one system is of high frustration and value. As noted above, online SaaS tools for engaging media have been around for a while. Three drivers are moving consumers into more comfortable adoption: work, tablets, and ease of start-up alternatives. Tablet Momentum: Tablets have been around for many decades, but the growth since 2010 of iPads has increased expectations for users to be able to thrive without carrying around massive hard drives. iPad and Android-based tablet users expect access on each of their devices and formats. Handsome user interfaces and added-value visuals are progressively part of baseline expectations on tablet and smartphones. Increased tablet-based usage rushes more content into the cloud, instead of buying the next devices with a gigantic hard drive. Cloud-Based Infrastructures and Platforms: New services are growing off of IaaS and PaaS platforms. Shared infrastructures and platforms allow start-up cloud-based media services to launch without independent massive investment in inflexible storage and fixed infrastructures. A niche, start-up provider can perch on cloud-based IaaS infrastructures for storage and platforms. [i] National Institute of Standards and Technology’s (NIST) working definition of cloud computing, the 16th and final definition has been published as The NIST Definition of Cloud Computing (NIST Special Publication 800-145). [ii] Chip Walter (2005,July 25). “Kryder’s Law: The doubling of processor speed every 18 months is a snail’s pace compared with rising hard-disk capacity, and Mark Kryder plans to squeeze in even more bits,” Scientific American. [iii] Francis Cairncross (1997). The Death of Distance: How the. Communications Revolution Will Change Our Lives (Boston, MA: Harvard Business School Press). [iv] Bianca Schroeder and Garth A. Gibson (2007). “Disc failures in the real world: What does an MTTF of 1,000,000 hours mean to you?” 5th USENIX Conference on File and Storage Technologies, p. 1-16. “Storage”: An interesting word in the context of “digital stuff.” Like the word “collect,” storage implies that it is our “digital stuff,” that we have ownership rights to it. Storage, as a social metaphor, brings with it context from our daily, physical lives. It may bring to mind Public Storage units, areas under overpasses where we put the detritus of our lives: mom’s sofa, the wagon wheel coffee table that we fight over, or three rooms of furniture as we downsize homes. Storage bears echoes of George Carlin’s 1986 comedy routine about stuff to hold our stuff in. He detailed how we have stuff everywhere and have some stuff that is more important than other stuff, which we want to keep with us always. Our digital stuff holds many of those same traits: we have digital stuff all over the place, some is more important, and some we want to keep with us always as well. Email has become a “gateway drug” for the cloud, training users to expect abundance of digital storage. Digital storage was framed for many years as precious, to be used wisely. Previously, companies chastised their employees about using too much e-mail space through automated warning messages. Expectations have escalated since 2 MB in free email storage was offered by Hotmail in 1996. Yahoo started at 4 MB in 1997, and Gmail started its beta with 1 GB in 2004. Yahoo joined in with unlimited storage in 2007, and Google upped the game soon after with its “Infinity Plus One” storage plan, which has grown individual storage now to more than 7 GB for free unlimited storage for Gmail[i]. Hotmail has since moved to “ever-growing,” nearly unlimited storage, continuing to change social norms about digital storage expectations. Entire business ecosystems have sprung up, dealing with sharing, backup, and cloud storage. These tools have shifted home and business users to consider storage issues such as ubiquity, mobility, sharing, multiple devices, and permanence. Despite these roving ambitions, most people’s work and social habits have not kept up. Products have launched to help us filter and gather our email, though the majority of users still let the content swamp us out and push into unfiltered folders. 2011 was a year of many media “cloud” storage toolset launches, with more solutions to this “problem” on the horizon. Cloud-based content storage now reaches into consumer lives as well as business services. Digital media is a growing percentage of our personal digital storage. As a digital culture, we also are rethinking storage as to digital media. What are the problems that companies and consumers are trying to solve with cloud-based media storage? Is this time a transition while we are in changing habits of mobility, sharing, and recommendation with tablets and smartphones? Is it a transition, with different trajectories for our existing digital stuff and entirely new behaviors with new acquisitions and our own digital media creations? How might this transition drive permanent changes in our concepts of content ownership, collection, and storage? How will this change our willingness to pay for storage and to pay a premium for ownership? What do I expect from the stuff I need to manage my digital stuff? Is the nature of stuff itself changing? The music and book media sectors have been facing these issues head-on. Their company leaders have been forced to rethink what the context and containers for our media content mean in an environment of abundance. They have been rethinking books and music in a terrain of fluid data and scarcer time. Other sectors, including video and even education, may find ideas from looking to other media platforms and sectors for pain points, challenges, and new business models. Opportunities that lay beneath, beyond the popular discussions about content in the cloud. [i] Now adding 3.3 MB each day to the limit, per Google. We tend to start at the middle when sometimes we need to start at the beginning. Some of us at Maremel have been setting a non-profit organization up for cloud-based collaboration. To get them all on the same page, we helped them move their shared work documents to Google Docs. Movement screeched to a halt. Quite a few group members needed a tutorial-style boost into Google Docs — just the basics to get started — though did not raise their hand directly that they didn’t understand the basics. This need prompted us to return to the web for inspiration. 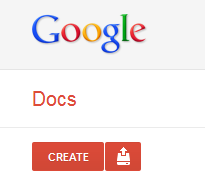 We took a look at the currently available tools online to understand Google Docs from scratch. We hope this might be helpful for some folks who might not be comfortable otherwise getting started by trial and error. We liked a simple and comprehensive PDF of how to use Google Docs that we found at http://onlineconnections.wikispaces.com/file/view/Google+Docs+Tutorial.pdf. It seems to cover all the basics clearly and cleanly with screenshots of how to use it. Google themselves has their help functions at http://support.google.com/docs/ and an Overview, which isn’t as warm and friendly. There are a host of other YouTube videos with instructions. Just search in YouTube on your specific question, which can be anything from how to use Forms (http://www.youtube.com/watch?v=IzgaUOW6GIs&feature=relmfu), details on how to use spreadsheets and documents, and how to use Google Docs in more specific situations. You can find a host of videos also within the Expert Village YouTube Channel: http://www.youtube.com/user/expertvillage/search?query=google+docs . We’ll be adding some digital basics to our blog in the future, just to brush us up on what is available, as well as what the current state of easy learning resources is online.